All sales start with a conversation, whether that happens over the phone, in person, or through email or direct mail. When it’s your job to start the conversation that will lead to a sale, you definitely want to begin with the right words. Today’s guest knows a lot about which words will best help you approach those conversations. Phil M. Jones is a professional sales coach and speaker. 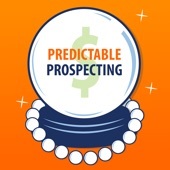 He’s also an author whose books Exactly What to Say and Exactly How to Sell provide the phrases and frameworks that can help demystify the sales process and increase confidence and sales success. Listen to the episode to hear what Phil has to say about the importance of word choice, the steps between a conversation and a sale, and the best kind of framework for a cold call. Marylou: Hey everybody, it’s Marylou Tyler. This week’s guest, I have been following Phil forever! I’m so excited that he’s on the show. He’s just so wonderful in all things sales. I really didn’t know where to pick. With his permission, we’re going to talk about two of his books. He has two great books out there. You guys need to go to Amazon right now and pick them up. First one is Exactly What to Say and the second one is Exactly How to Sell. Those are two of many books that he’s done. He is just an incredible speaker, he’s delivered 2000 presentation in 50 countries across five continents. He is just amazing. Lots of videos out of YouTube to give you really actionable advice. The list goes on. I’ll put his information in the show notes, but for right now, let’s get to business. Welcome Phil to the podcast! Phil: Thank you for having me. An introduction like that, you’re making me blush already. It’s lucky, this isn’t on camera. Marylou: As I told you when we were offline, I grabbed your Magic Words ebook, that’s out on the internet, so you folks go find that. I’ll put it in the show notes too so you can sign up for his newsletter. But we started testing some of the magic phrases that you put in the Magic Words ebook in our cold stream and in some cases Phil, we had tripled our response rates. I’m beyond excited to be able to talk to you today. Phil: That’s what we like, right? All for the purpose of the success and change and making things making things easier for people. Marylou: Definitely. Let’s get started by talking about my audience which is top of funnel. We are sales executives, we’re also marketers and business developers who’s really chartered with trying to get that foot in the door, get a cold conversation started, get to the first meeting, and also to follow up on people who’ve come in bound or through referral sources where we’re doing those follow on conversations. I’d like you to help our audience understand what challenges that they can overcome? How they go about doing that? I think the Exactly What To Say book is the one that we should focus on for this podcast. Could you start by telling us what caused you to write that book and what do you still see in today and how do we fix it for our folks? Phil: I think one of the biggest things that we must first think is when is the worst time to think about the thing you’re going to say? Right here right now in the moment. What often happens is in particular when we’re finding ourselves needing to make an outbound call in the form of follow up or in response to some form of inquiry, we think, “I’ve got a call,” and we jump into that call and we don’t really know where to start, we don’t really know where we’re looking to go, we don’t really have a planned call track, people will fall back on the scripts or they find themselves just cobbling something together, which is typically the norm. I said a second ago, the worst time to think about the thing you’re going to say is in the moment when you’re saying it. The reason I say that to be true is that what I’ve learned from training over two million professionals around the world, is often the difference between you and people like you, isn’t your skill, your endeavor, your pricing, your products, or any of those key factors that people put so much emphasis on. It is when the rubber hits the road, then you know exactly what to say, when to say, and how to make it count. It’s word choices that are remarkably important. Yet, there are conversations we find ourselves in the world of business are remarkably repetitive. I’ve learned that actually, there are certain trigger words, there are certain sequences of words that talk straight to the subconscious mind that allow us to have more control in our conversations. That’s what we’re looking to try and achieve. Through exactly what to say is to give people the power, the principles and the philosophies behind why certain words work so that we can do something that feels like us but drives through results. Marylou: You came up with a number of different phrases. Is this all through trial and error? Because you said you worked with a million something like that people? Marylou: Two million people, you have a really good data set and really good probably scientific— this really works people and this is where we use it. Is that what happened? You started working these phrases and testing them with your clients to develop the list or is it just said as you start having conversations, you recognize or a certain phrases that you said are repeatable? Marylou: This book is just incredible, by the way. What made this book actually stand out with those phrases? How did we come up with those phrases? Phil: There’s a lot that goes into this. To produce the book that you can cover to cover in 60 minutes is crammed with so much content. There isn’t one viable source. I’ve been in business for over 20 years, I’ve been involved in the art of negotiation for that same time period. I found myself in literally millions of conversations, toe to toe with other people, looking to influence the outcome in one way or another. The commonality I found in both the conversations I was having personally and the conversations that was happening in the people I was witnessing, coaching, training, supporting and leading was words really did matter. This made me super pedantic about this because what I was being asked to do in some of my early careers was how can I influence the outcome of success for the world of sales. What everybody else was doing was saying, “Try harder. Speak to more people.” I was thinking instead of counting conversations, wouldn’t it make more sense that we could make more of our conversations count because we do all get to a point where there is a finite amount of resource. Let’s look to see what we can do to have more influence over those conversations. I would reverse engineer both the success of my own conversations and the success of those that I was seeing and I would find the commonalities and the traits in language that would allow us to have both more competence and more confidence in each of those conversations and those two things combined would lead to more success. Marylou: Now this is something, as I mentioned earlier, we took some of the phrases from your document and applied them in email setting. This perfectly works in all types of conversation whether it’s direct mail postcards, which is on the uptick now for us for response rates, whether you’re doing a voicemail, leaving a voicemail or having a physical conversation remotely or face to face, correct? Phil: It does. Much of the premise of where the book came from is learning from the art of conversation. I think we’re all looking to be more conversational. We can be conversational in all of those mediums that you played out. I think, something that everybody should also consider those—what we’re looking to do is to steer or control a conversation. The person who’s in control of every conversation is the person who’s asking the questions, not the person who’s giving the answers. What also is true is that a question will lead to a conversation. Conversation leads to a relationship, a relationship creates an opportunity, and only the opportunity creates a sale. People are often looking to be able to get straight from the beginning of that queue to the of that queue. What we can’t do though is we can’t skip any steps. We have to know that questions create conversations, conversations build relationships, relationship creates opportunities, and opportunities lead to sales. The words and exactly what to say are designed with the purpose of saying, “How do we open more doors? How do we then look to better explore what those possibilities are? How do we then look to better say we can assist people through their decision making process and what do we do when people say maybe? There really is that simplicity attached to it. I think when we breakdown what we’re looking to try and achieve, I think about what the outcome is from what we’re speaking about first, we can have more influence in those conversations. Let’s bring it back to how we go through in a follow up phone call. People have to find themselves thinking, “What am I trying to achieve here?” Give me some scenarios or some setups as to what might be normal in your world? Somebody receives an inquiry through a web form. What are they looking to try and achieve from that outbound conversation knocking from there? Marylou: We have two scenarios there. One is they have come inbound. Let’s pretend we’re doing a service. A lot of my clients are selling services. Products is another area. But let’s do services. So they fill out a form, their interested in the service, the contact us form, they tell them what they want, and it’s very minimal. We basically have the name and the company, the person who filled out the form, they gave us a high level of what they’re interested in and then it goes into our queues for us to follow up in a prescribed amount of time depending on the size of clients. We look to see what the account tier looks like. Is it a complex sale or is it a transactional sale? Let’s pretend it’s a complex sale that came inbound and now my job is to follow up, to find out whether or not they’d be a good fit for us with the goal of getting to a discovery call so that we can see if it’s worth our time, their time to take it to opportunity. Phil: Goal is typically a discovery call if the fit is right. What I’d like to better do is certainly from my point of view is to ban the words ‘follow up’ just for the purpose of the next part of this conversation. It suggest somewhat there is—this is finite activity with a start point and an endpoint. What we’re looking to have is a continuous conversation. For the purpose of right now, let’s think about what we need to do, we need to respond. What they’ve done is they’ve started a conversation, our responsibility here is to respond in some way. Our goal is to control the conversation to the purpose of discovering if there is a genuine opportunity and if so, can we move it to words and more purposeful conversation? Did I get that part right? Phil: Let’s first lift the formula that comes to my book of Exactly How To Sell to be able to give us an application into anyone of these types of phone calls. A simple formula is an opening formula to start any conversation quickly and precisely how to maintain control and it’s to start with a polite opening, followed with the mutually agreeable fact, and the follow that with a question, so three-part formula—opening, a fact, and a question. We straight into the meet of the meeting. It’s not, “Is now a good time to talk?” Which is the stupidest thing anybody can ever say in 2018 and onwards, because if it’s not a good time to talk, what do we do in today’s day and age? Marylou: We just basically don’t respond, don’t answer, don’t know anything, swipe left. Phil: Right, because we known that now. Is now a good time to talk? It is a prehistoric set of words that when people had house phones and they didn’t know who was calling or people had office phones and didn’t know who was calling and when the phone rang, it was because it was an impending emergency or something super important. We are trained differently right now. The question should never be, “Is now a good time to talk?” Or what we might like to have is an opening fact question that gets us straight into the heart of the conversation. It may well be that if somebody has downloaded a white paper, or a report, or a PDF from your website, opening could be, “Hi, it’s Phil calling from *insert company*.” Fact could be, “I could see that you were on our website just yesterday looking to download an ebook on, a paper on, a report on. I just wanted to check, did it download okay?” “Yeah, yeah, downloaded fine.” “Now I am guessing you didn’t get around to reading it properly,” “Yeah.” “But it was one ring, what was it that brought you to our website in the first place?” Zip it. Now, we’re into a meaningful conversation while the other person does all the work. Instead what often happens is we respond to these calls and then we vomit our features and benefits all over the other person, hoping they are going to like what we have to say. What we must first understand is that selling really is. Selling is earning the right to make a recommendation. I repeat, earning is the right to make a recommendation. What that means is that we should never ever invite somebody to buy, step, move forward, with any of our recommendations unless we can say these facts first. We should be able to say it’s because of the fact that you said X,Y, and Z for those reasons, what I recommend is A, B, and C.
Now, in a scenario like this, we might be saying for example, it’s because of the fact that you said, that you’re serious about making a lasting change with your people, and that you’re committed to be able to work with a trusted provider and that you want to be able to get on with this in the next couple of months, it’s for those reasons what I recommend isn’t the best place we start is with the 90-minute discovery call where we can uncover the heart of the issue and to show that the recommendations that we make are solid, purposeful, and meaningful. Marylou: It sounds so fluid. I love it. Phil: But why does it sounds so fluid? Because what we have is we have anchors and we have structures. We know that the worst time to think about the thing you’re going to say is in the moment of saying it, and we know that what is going to happen here is that more of our conversations are repetitive than they are different. In the written word, almost every individual in business has dozens of Word documents or copy paste versions of things that they rely on regularly. All they do is they customize as required on a per client or per account basis. Marylou: We call those swipe files. Phil: We don’t have so many swipe files in our spoken word, yet we should do. People are scared of them, you see because I think they’re scripts. People are scared of scripts because they think they’re going to sound canned or they’re going to sound like somebody else. Marylou: I love scripts. I love them because we start with words that we practice, practice, practice and then it goes to bullets, and the it goes to our DNA. I am a big fan of starting with mapping out the conversation and what you’ve given us is a framework to do that. This is in Exactly How to Sell, correct? Phil: That framework there is in Exactly How to Sell, and what Exactly What to Say is subtle nuances of words that can lead us into more powerful conversations. We could actually lift some words from Exactly What to Say that will allow us to have more meaningful conversations leading to what is this discovery call. Now, how open minded would you be to spending 90 minutes on the phone for us to discover further? How we might be able to work together? Marylou: Or would it be okay if—we tried that phrase and it was just gold for us. It really was. It’s so funny that you said that about, did I catch you at a bad time, because in my previous book, in Predictable Revenue, we talked about doing that, but that was 2011. This is now 2018. It worked then, but not now. You have to continually optimize and upgrade the nuances of conversation as we move further and further into more technology, that’s for sure. Phil: The principle doesn’t change though. The principle is permission. That’s what we’re looking to get a lean towards is, are we okay to have the next part of this conversation? The quicker you can get to a position of permission and being on the same page, the more productive a conversation you can have. That requires a framework. Is now a good time to talk—used to be a successful framework that led toward permission. It’s now a lazy route. What we should rather do is to say, “I get you.” That’s what happens here if you use opening a fact question, is very quickly, you can set up the framework here with permission, it gets the other person to say, “Yeah. That’s me. You know me? You know what this is about?” This is now not pushy. This is a purposeful conversation about something I register as interesting. Phil: I hate it. Even if a friends says it to you, what do you say back to that? “You know, I’m fine. I’m good. Thanks for asking.” It’s a waste of words. We shouldn’t even talk about it. Just checking in. Marylou: I always wanted to build a list of words that you should never, ever, ever use and that’s definitely high up of that list. I see it all the time still in emails. Phil: Here’s how we can stop ourselves needing to have like, “I’m just checking in a phone call.” It’s never hanging up a phone call without having a scheduled next action. What I can now do is I can start that phone call differently, I can start it with the words, not, “Is now good time to talk.” I can start it with the words, “I’m just phoning as promised.” In which they now cannot only say, thank you back, when they say, “Thank you,” back it means they feel indebted, which is a great way to start a phone call when you might want something with somebody. I’m just going to run this through further is what now happens is, we could start with, “I’m just calling as promised.” We can get, “Thank you,” as a check back in terms of permission and I can then now ask the question directly as, “How did things work out with the project?” Then I can shut up and listen. Marylou: Fabulous. If we go back to that opening formula that you gave us of a polite open, a fact, and a question, let’s look at now in our remaining minutes, how we would open a call for someone who did not sign up of our website, who did not request that we contact them, but would be delighted to hear from us because we have something great to share with them? How would we open up that call. I hate to the word “call” but it’s that kind of conversation where it’s the first time. Phil: You said, “They would be delighted.” Let’s rephrase that to, “They may be delighted.” Let’s understand that that could be true, but you’re making a phone call to a stranger. First thing, what I understand in that is what can I do to make this person feel less like a stranger? In my book Exactly How to Sell, we talk about how to build a prospect list utilizing your FRIENDS. An acronym out the word FRIENDS. It might create a way that we can create an opening into just about any type of person with the purpose to that phone call that isn’t, “I’d like to sell you my thing.” Which is a step in the door and think about how that plays out in our real world, whenever you’ve said to somebody maybe is a potential future partner in the dating world and you said, “Let’s meet for coffee.” It wasn’t the coffee you’re interested in. The same thing is true often when we’re opening a phone call to a cold prospect. We have to get a place to start, that’s how we win […] with coffee with that individual that then allows us to be able to uncover whether there is truly a fit. We’re going to still use an opening of fact and a question. The opening is probably going to be the same opening. Can you give me an example of what the type of company is that we might be looking to make a phone call towards and I’ll give a precise or an exact routine. Marylou: Let’s do that. Mostly, I know that most of my audience are probably technical sales. Let’s do that we’re calling into the technical director of a company and he doesn’t know who we are and doesn’t know what we do, and where our goal is to be able to build the awareness, introduce this thing that he may want to consider at some point. But he’s probably in that underwear state and he doesn’t even necessarily know he has a problem, but it’s that technical interface that we’re trying to get into have that “are we fit” meeting. Marylou: That’s very good. A little bit of flattery in there about valuing opinions. Phil: The difference here, the difference is posture. What I am doing is I’m approaching this from the get-go with curiosity laced for everything I’m putting out there. I’m not saying, “Hi this is us with a company. I want to tell you about a fact that we’re so awesome and that our product has been able to be able to do this, this, this, and this, and you really need to take advantage of it because I know that we can do massive things within your company, yadah, yadah, yadah.” What I’m saying is this is me, this is what I know about you, is this true? Marylou: You know the result of that call, you’re able to file it properly because you’ve learned something new, it’s a meaningful conversation. Those count in our world. Phil: Right. We all live with posture. Here’s an image that I want everybody to just picture in their mind of what you never want to be. You never want to be that turtle, lay on their back, with all four limbs up in the air, wiggling around. That’s what I hear when I listen to lots of sales call when I work within organizations and I help them develop their phraseology and help them develop other questions, is when I listen back to calls, I hear this desperate begging plea saying, “Please pick me, please pick me, please pick me.” They say, “No thank you.” They say, “Please, pretty, pretty please.” It’s always awful to be on the receiving end of—it’s even worse to try and do the reviews and analysis. Marylou: I think a lot of it stems from the fact that we don’t really practice and hone in and just get out there and study this stuff so that we have a fluid delivery. A lot of it is knee jerk reaction, no planning, and hoping—that word hope—sprinkles throughout that someone will just say yes so that you can just do the next step without having to do any type of rhythmic approach with them. Phil: Practice this stuff in a safe environment. This would be my challenge to everybody. Don’t wait until it’s the most important phone call for you to make. When you’re dialing “0” at a hotel because what you is you want something to be delivered to your room. Use opening fact questions, see how it plays out. When you’ve got a situation to call a service provider in your life, and what you’re looking to be able to do is to get somebody to help you with your internet, or that you’re looking to make a restaurant reservation. Use opening fact questions to able to lean in to that call. When you’re looking to be at a shop around for multiple quotes because of the fact that you’re looking for some home improvement. Use opening fact questions to get you into the conversation quickly and easier. You can practice these things in so many different areas of life as an opening that gets you into more meaningful conversations that is delivered with more permission. Just spend more time making more of your conversations count. Marylou: Wonderful. Phil you’ve been so generous with us and you’ve also been generous with our audience. For those of you who want to follow Phil, philmjones is his website. I’ll put everything in the show notes, as I said. But you also have a YouTube channel. My students, as homework, I had them look at all your YouTube videos where you take each of these constructs, break them down, and teach people how to use them. Then there’s the books, what else can we tell the audience of how they can get a hold of you? Phil: They’ll be able to find more from building up my website, there’s a couple of other thing is that I do have an app with some podcasts on it that people can plug into with some simple bite size lessons in it. More than that, come and join the conversation. If there’s something you like about the thing that we talked about today, or you picked up my book or you listened to our audio book and you’ve tried something that’s worked and you want to let me know, then come find me on social media, come shoot me a note on LinkedIn, come talk to me on Twitter, any of those platforms that are most preferable to you and know that I know that questions leads to conversations, conversations build relationships, relationships create opportunities, and opportunities lead to sales. We might be able to do some business together someday. Marylou: That framework again. Let me see if I can repeat it. Questions leads to conversations, conversations lead to relationships, relationships lead to opportunities, and opportunities lead to sales. Phil: There we go. Nicely done. Marylou: Thanks again, Phil. I really enjoyed our time together. Phil: Thank you so much for having me and thank you for listening.